The Wolf Queen, v7 determines the date of Pelagius' birth to have been in 3E 125. If so, he would have been twelve during the Siege of Solitude, which The Madness of Pelagius asserts was his first battle. 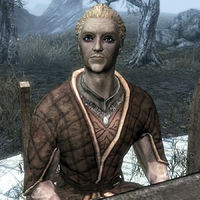 Wabbajack apparently tells the tale of a new king of Solitude who lost his mind after accidentally summoning Sheogorath. ^ a b Dialogue of Howling Halls residents of the Shivering Isles. This page was last modified on 27 December 2018, at 19:35.